Value investing is simple, yet isn't easy. The wait for value to emerge and the subsequent wait for value to unlock, in most cases, is a protracted and a painful one. What makes it worse (emotionally of course) is when value emerges the slide doesn't stop just because it is undervalued, given market's manic tendency to undershoot. After all the wait for markets to come off the overshoot, the notional portfolio erosion during the under-shoot after initiating value buying, makes even the staunch value investors shaky. To digest the erosion and still have the nerve to add during the undershoot, knowing well the long wait ahead for the value to rerate (unlock), is what makes whole process gut-wrenching. Similarly, even the rerating ride (upward value unlocking journey) is equally rocky and bumpy with many false starts and vicious falls. If one adds client's expectations/pressure into the equation, hardly can anyone envy the money manager who has taken the road-less-travelled path of value investing. If this is not hard enough, such money managers have to go through this cycle multiple times to create value over long-term. Add to these, the challenges that come frequently while deploying cash in a falling market. After holding cash for a reasonably long time while the market kept rising, when the market turns and cracks, it will be tempting to quickly deploy when valuation turns attractive. If the market undershoots further, as it normally does, depleting cash too quickly tempted by attractive valuation could hurt the portfolio. Alternatively, if the market bounces quickly without undershooting further, decision to deploy quickly could prove to be a genius one. Both are possible outcomes in any market (irrespective of the economic fundamentals at that point of time) depending on to what extent the fear cycle plays in the given point of time. Let us illustrate this by an example. 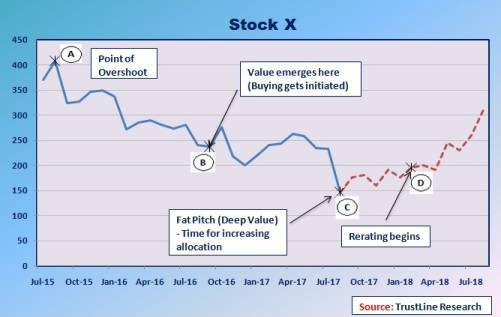 Given below is the price-chart that captures this dynamics for a stock that has moved into the deep value zone recently. In the below chart, point A represents the point of overshoot, point B represents the time from which value starts emerging, point C represents the point of undershoot where it becomes a deep value and point D representing the beginning of re-rating. As one would infer, the overall time for the entire cycle to play out, from overshoot to undershoot and then to re-rating, goes even beyond three long years. In some cases, the wait could be even longer if the undershoot turns ugly or re-rating gets retarded, depending on the extent of bearishness in the market. The above chart is not an imaginary one. It is a real one (except for the dotted segment) for a stock that has turned deep value in the ongoing correction. It is a price chart of a company that is into renting high tonnage cranes for the wind sector. With the wind sector suddenly losing shine on serious short-term setbacks, this stock is on a free fall, thereby providing a fat-pitch opportunity for value pickers. Value opportunities are not limited only to few stocks. With bubble popping out in small and midcaps in the ongoing slump, many stocks have sunk to new lows, thereby providing entry opportunities. For anyone who is willing to invest on the emotional capital of "Waiting", these are great time to load up one's shopping carts. Investing isn't easy. Superior skill and extra-ordinary nerve are required to achieve above average results in investing. To quote from Howard Marks memo, "So, in the end, there is only one absolute truth about investing. Charlie is right: It isn't easy"